Landscaping with rocks is a great way to create a landscape that is less work to maintain than most other alternatives. Stone is available from a variety of suppliers at many different price points, so exploring all your options should be your first step. Stone walls are a great way to incorporate stones into a landscape. Most retaining walls are being built with manmade landscaping blocks that interlock and go together rather quickly. These are great in many applications. Field stone, on the other hand, requires some real attention to detail. Unlike manmade blocks, field stone is irregular. This creates challenges for the stoneworker to lay out the stones so that they interlock without leaving large gaps. One type of stack is called a dry stack. This old world method does not use any mortar between the stones. This puts an extra burden on the stoneworker/mason to make sure the stones fit together tightly. A wet stack, on the other hand, uses mortar to help add rigidity and strength to the wall. No matter what type you choose, it will provide a nice visual aspect to a garden plan. Stone can be used in other areas around a landscape as well. Very large stones can be maneuvered into place to act as a visual focus point. These might be installed in a corner to help break up a drab, unused corner. 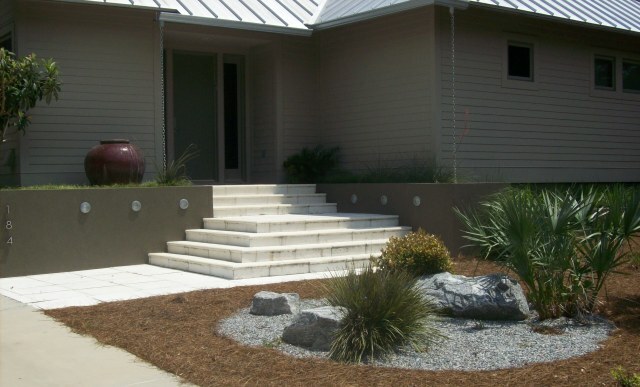 Other stone applications could include the use of crushed stone on walkways or patios in place of cement. This will create a more casual feel for a relaxed sitting area or meandering path. Other uses of stone can include surrounds for trees and ponds as well as such things as sitting benches and bird baths...the possibilities are endless. Go to the Home Page from Landscaping with Rocks.